For decades, the tiny village of Ravenmoor has existed quietly on the upper reaches of the Lampblack River, far from the centers of civilization in Varisia. Linked to the outside world only by an overgrown, mostly forgotten trail, the villagers are comfortable with their isolation. Their ways are humble, quaint, and at times odd, and when travelers come, they find the town awkward and unmemorable. Certainly, the lack of a village inn, the oppressive humidity, and the bug-infested moors and swamps that surround the village do little to encourage visitors. When a clerk in the city of Magnimar discovers that, due to a clerical error, the village of Ravenmoor hasn’t paid taxes in years, a tax collector is sent to the distant community to settle accounts with its mayor. When the tax collector fails to return, however, a group of adventurers must travel to the town during its Founders’ Feast celebration to investigate his disappearance. Did he really make off with the taxes for himself, as the villagers suspect? Or did he never make it out of Ravenmoor at all? Feast of Ravenmoor is an adventure for 3rd-level characters, written for the Pathfinder Roleplaying Game and compatible with the 3.5 edition of the world’s oldest RPG. It features a terrifying adventure set in a rural village in the frontier realm of Varisia, and a brand-new monster eager to torment and frighten unsuspecting adventurers. Pathfinder Modules are 32-page, high-quality, full-color, adventures using the Open Game License to work with both the Pathfinder Roleplaying Game and the standard 3.5 fantasy RPG rules set. 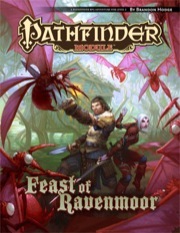 Feast of Ravenmoor is sanctioned for use in Pathfinder Society Organized Play. Its Chronicle Sheet and additional rules for running this module are a free download (217 KB zip/PDF). This was a solid and fun module to GM. It's put together well. I can't get enough of things like the Founder's Feast event in this, which provide a wealth of roleplaying and problem solving opportunities. I ran this for 4 very experienced players, with 4th level characters that punched well above their weight. I inserted it as a prequel event to the start of Shattered Star part two, and it worked great for that. In addition to a lot of tweaks that I made to customize this for my players and campaign, I had to fix some things to adjust the flow of play and the story conclusion. Those were all simple but I think the experience would have suffered some if I didn't have the time or experience to do that. Still, this is a well thought out module and I give it full marks. Written from a GM's perspective. I ran this for 6 PCs. I ran this with my group for three sessions (about 3 hours each) and found it to be a wonderfully compact module with great setting and story. By far the strongest element of this module is its tone and setting. The book gives some really nice additional information about the customs of Ravenmoor that really helps make it feel like a strange backwater village where something isn't quite right. This made it very easy to make the location almost immediately feel mysterious and more than a little creepy. The investigation portion of the adventure was also well done. It gives the players a slow trickle of information that something is wrong, while still denying them a clear picture until the big finale. I also liked how the encounters were included into the adventure. Creatures that were fought, like the stirges and mongrelmen didn't feel like they were just randomly pulled out of the bestiary for the sake of having an encounter. Everything had a backstory and everything felt like it belonged in Ravenmoor. I don't really have much in the way of criticism for this module. I would warn GMs that the final few fights were reasonably challenging for my party of six. A smaller party might find them to be a bit too deadly. Also, for those familiar with the genre tropes of the adventure some aspects might be a bit predictable. For example, my players immediately expected Shel to be a sacrifice as soon she told them about the Founder's Feast. However, I don't think this ruins the experience, as there is a certain charm in it's familiarity and how well it achieves it's intended tone. Overall, I would definitely recommend this module to anyone looking for something short, fun and a little bit creepy. Wonderful gem of a module. The front half is littered with fantastic roleplay elements that do an exceptional job at building the setting as well as acclimating players to small town quirks, while the second half is sure to satisfy both roleplayers and roll-players. Other reviewers have highlighted that there is an orientation issue on the two large maps that is particularly jarring when describing the transition from one map to the next. However, I would not allow a minor issue like map orientation (that probably wasn't in the hands of the author anyways) to negatively color my opinion of what is otherwise an outstanding module. I've recently GM'ed this and loved it. The fights aren't too hard..in the start, but once the PCs get into the final area, they can expect some decent resistance. The atmosphere in it is fun to RP out too, from both PC and GM perspective. If the PCs are particularly skilled in Sense Motive, and with asking the right questions of the one in charge, choose your words carefully or they might do something unexpected. It gives a more 'surprise! ', when they discover the proper person is the BBEG. The final fight can be potentially deadly for lvl 3. I ran it with 3 lvl 3 and 1 lvl 4. The tactics as written can work, but don't hesitate to have the BBEG play dirty within his options. All in all, a great module i definitely want to run again in the future. I can't explain how I love this! Fantastic combats, high-pressure atmosphere, flavorable NPCs, COC style investigation, everything just perfect even one character died. Require experienced GMs to make up the setting, not an easy module to run, but fantastic, also good for non-PFS games. Just announced for September! The cover image is a mockup, and will change prior to publication. Sold on the premise alone! Sounds interesting to me.. but who am I kidding I have purchused every module so far so why stop now. Thanks for the props, Asgetrion! Oh. Wait. Paizo wants me to WRITE this thing? Like, type it out and all that? I wasn't sure that's what they meant when they asked me to if I wanted "a shot at the feast of Ravenmoor." I thought they were inviting me over for tequila...at a big dinner...and "ravenmoor" was just an RPG slang euphemism for "eat more chicken." Well it is the "feast of ravenmoor" so i would say he was eaten. Of course, "The Wicker Man" was one of the big inspirations for this adventure. "Feast of Ravenmoor" is actually based on a short story I wrote many years ago that I've been wanting to turn into an adventure for almost as many years—it's why I put Ravenmoor into Varisia in the first place back at the start of it all. And while that story was partially inspired by "The Wicker Man," it was also inspired by Lovecraft, by Stephen King's "Children of the Corn," and by all the creepy old shacks in the woods I've seen in my life. "In addition to the adventure, this book features a brand new monster and a regional gazetteer detailing the Ravenmoor hinterlands." Is this going to be standard in all up coming modules? A new monster and a regional gazetter? A new monster per Module has been pretty standard since the very beginning. Starting last summer, we standardized the format to always include 1 new monster and a two-page spread on a Golarion location. It might be a regional gazetteer in some, a city writeup in another, or a specific location like a magic academy or Varisian caravan in yet others. Clearly I haven't been paying attention to them enough. Thanks. There's a funny sidenote about having me write this adventure, though I'm not sure James remembers. Back when we were first plotting From Shore to Sea, the initial village scenes were heavily influenced by a recent repeat-watching of Children of the Corn and Village of the Damned, not to mention way more parallels to Shadow over Innsmouth. The focus was a lot more on what was going on in the creepy village of Blackcove, and the island was really reserved for the final encounter/secret bad-guy base. When James saw that initial outline, he had me yank a lot of that stuff to focus on the island, and told me to save all that other stuff for later. Of course, he was right, and we got a fantastic adventure in the end. And now, about a year later, James shows up with a killer outline, and absolutely turns me loose on the creepy village theme he denied me the year before. There is certainly something about the inspirations of old shacks in the woods, and James must have remembered that I grew up in the sticks of Southeast Texas! There's a funny sidenote about having me write this adventure, though I'm not sure James remembers. Heh... I do indeed remember. And it was precisely because of "Feast of Ravenmoor" that I wanted you to focus away from the creepy village elements. Even though it was a year or so before we had "Ravenmoor" on the production schedule, I knew I wanted that adventure to come out at some point. I happen to think the module line is probably the most under-appreciated of the Pathfinder lines. There's lots of good stuff in every book. I swipe stuff all the time for use in my games, even though I've only ever managed to run one of the modules intact in my game. Out of interest, will this module be approved for Pathfinder Society Organized gaming, like "Cult of the Ebon Destroyers" or "The Godsmouth Heresy"? Mark has stated that their goal was to approve all Future Modules for PFS play as they come out. The copy for this item uses the word "remote" a lot! It would be good to fix that before it goes to the printer. That's funny! I'm prepping the final document right now, and just searched for "remote" and discovered I didn't use that word once in the adventure! In any case, these blurbs often change after the adventure gets finalized, so I'm pretty sure that isn't back cover copy at this point or anything -just the teaser text. Groovy. I remain ever vigilant against the menace of linguistic ticks. That's the original solicitation text, which was probably written before Brandon was even given the project. It'll be replaced with the real back-cover copy after it's finalized. I thought the raven always wanted less, not more. Quoth the Raven "never more," right? I really think The Raven poem is where a lot of the "horror" sense of stuff with ravens in the title comes from, but the immediate association with Ravenloft that springs to mind doesn't hurt. It wasn't lost on me that the town in the first Carrion Crown adventure was Ravengro either. I want to see something mention a murder of crows or an unkindness of ravens. I mean who thought that up? A group of ravens is an unkindness? That's cool and true, though probably archaic now because people have to know it to say it, right? You might want to take a look at The Skinsaw Murders' bestiary. If I remember aright. Do we know when the real cover will be revealed? Were about a month from release. Yes, Ravenloft (along with Poe's classic poem) is what I had in mind. As for "unkindness of ravens", this noun dates back several centuries, and it's not widely used anymore. The first known literary reference I could quickly find is in 'The Book of Saint Albans' (or 'The Boke of Saint Albans') published near the end of the 15th century. This book also lists other collective nouns for birds, such as "a siege of herons" or "a badling of ducks". Some of them were invented by hunters, while others may be based on old legends -- which is exactly what James Lipton writes on "unkindness of ravens" in his book 'An Exaltation of Larks' (published in 1968). Why were ravens thought to be "unkind", then? According to Lipton, it is mentioned in 'The Folk Lore of British Birds' (back in 1885) that this "term of venery" comes "from the legend that ravens pushed their young from the nest to be ‘nourished with dew from heaven,’ until the adult birds ‘saw what color they would be.’"
Answers.com mentions two other such nouns: "a constable" and "a conspiracy". Quoted from the site: "A constable of ravens refers historically to the group of ravens that congregated around the Tower of London; they were thought to be 'keeping watch' over the monarchy. Therefore, any time a grouping of these birds seems to be watching or guarding something, the group can be referred as a 'constable.' They can also be called an unkindness or a conspiracy - likely for similar reasons. If a flock is driving off other predatory or carrion birds, or 'picking on' another species either because it is competition or prey (although they feed largely on already dead animals, they are known to work together to hunt if need be since they are extremely adaptive birds), then these are apt terms." That is a quick search on the etymological roots of this particular term; I'd be more thorough if I were at work and it wouldn't be 2AM over here (I'm off to bed soon). Qlippoths and mosquito demigods involved. Can I see that catalogue online somewere? Yes, you can. It's the first link on that page. Creepy! Can't wait. Thanks Lanx. Those are some freaky pink things. Yeah they look like stirges to me and a lot of them at that. Do we know when we'll have docs for pfs play. I've got a table of players crazy for this. One of them is my wife, so I'm driven by a dual imperative. PDF's are going out to subscribers already. It started yesterday, I just got access to mine a couple of hours ago. So if you are a subscriber you should have yours maybe tonight or likely tomorrow or friday at the latest. All Pathfinder Society resources for playing Pathfinder Modules for credit within the campaign should be released on the adventure's street date, which is September 14. At that time, we'll update the Additional Resources page to include it and put the Chronicle sheet download both on that page and on this product page. Call me OCD-afflicted, but is the title of this module ”The Feast of Ravenmoor” (as listed here) or ”Feast of Ravenmoor“ (as it appears on the cover and inside the module itself)? The name of the adventure is indeed "Feast of Ravenmoor." I'll see if we can get the title for the product page updated. ...Please don't send the cave raptors after me. We'll keep the raptors in check. * A clear good vs. bad plotline, even if who is who is not clear. * Lots of opportunities for both combat and non-combat gaming. * Well-written text that's enjoyable just to read. Even the very few bits, such as the meeting with Jeminda and the encounter with Ornigaard and his pet stirge are rife with versimilitude. I can believe these things would actually happen, and that's crucial to my enjoyment when running a game.